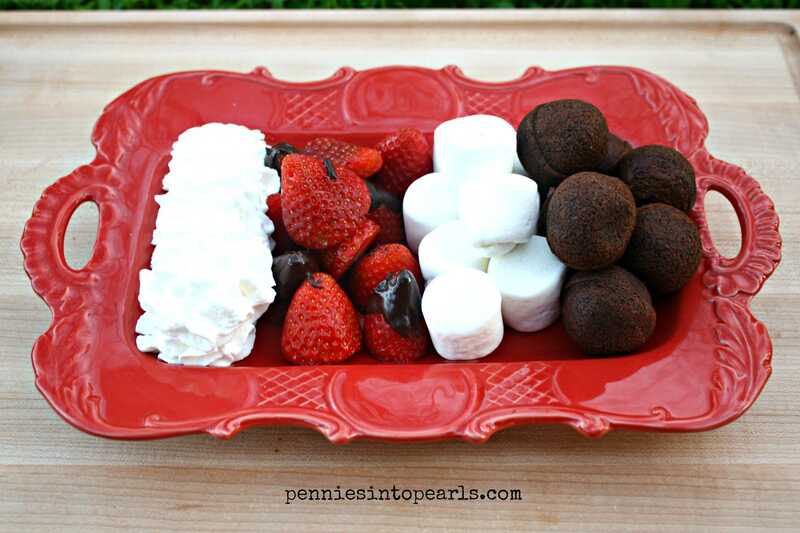 This simple take on strawberries takes a different direction from the always appreciated chocolate covered strawberries. 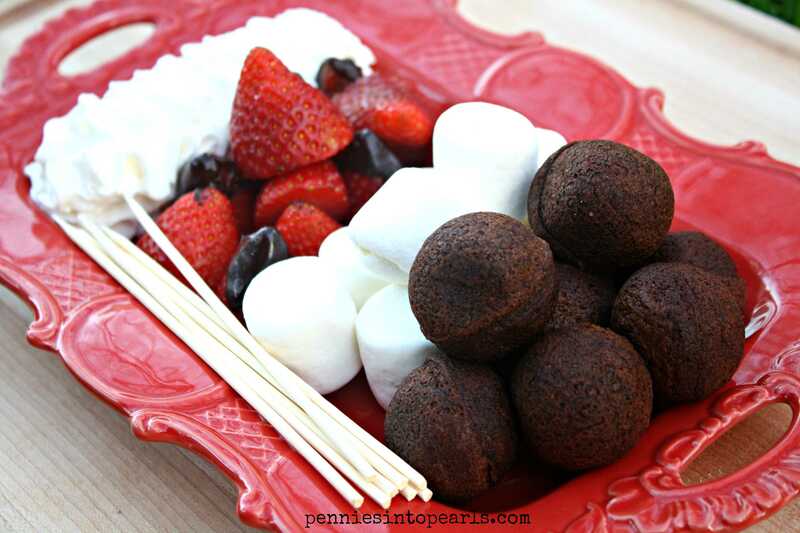 Instead of having the strawberries take the chocolate plunge, it was fun to tweak this treat a little and offer a different kind of Valentines treat. I chose to serve two different assembly options. 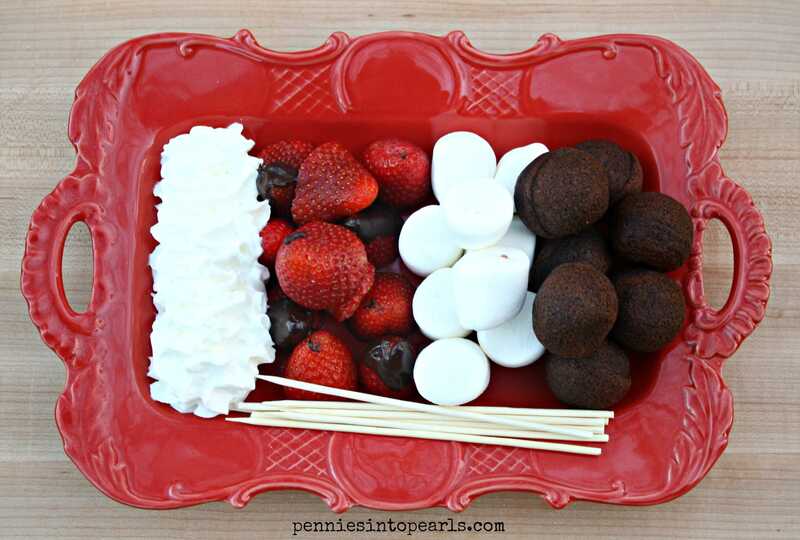 The first I created a few kabobs alternating between marshmallows, cake bites, and strawberries. Second option was a build-it-yourself buffet. Both options were a huge crowd pleaser in my house! Strawberries aren’t quiet in season yet so you probably aren’t gong to find them at an all time low price. But as the lovely holiday gets closer, keep your eyes open for sales. I found these for two pounds for $2.50, not too bad and they did have a great flavor! Decide on which assembly process you would like to offer your valentine and proceed as needed. I think this recipe is pretty self-explanatory but all I did to make the kabobs was alternate on which ingredients I placed on the skewers. Then once they were all put together I melted just a little chocolate to drizzle over the top. I did make my cake bites from scratch using my cake pop maker. But if you don’t have one of those you could easily cut pieces of angel food cake or pound cake to use. Another option would be to use donut holes. All are tasty alternatives! Enjoy! Oh my these look amazing. It’s okay to make these for breakfast right? I can’t wait to make these for valentines day! Thanks for sharing! Thank you Amy! And yes I could definitely categorize these as breakfast worthy! haha! Yum. And also, YUM. My son would love these. Thanks for stopping by Lynne! My kids couldn’t stop sneaking off bits here and there! haha! Thanks for stopping by Mimi! I just linked up and I am excited to have found another frugal link up, those are my favorite! Thanks for the tip! 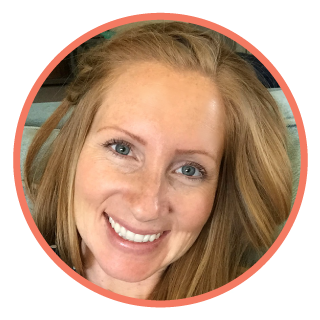 I wanted to follow your blog but couldn’t find your social media links? I did follow you on Pinterest though! Hello from Merry Monday! 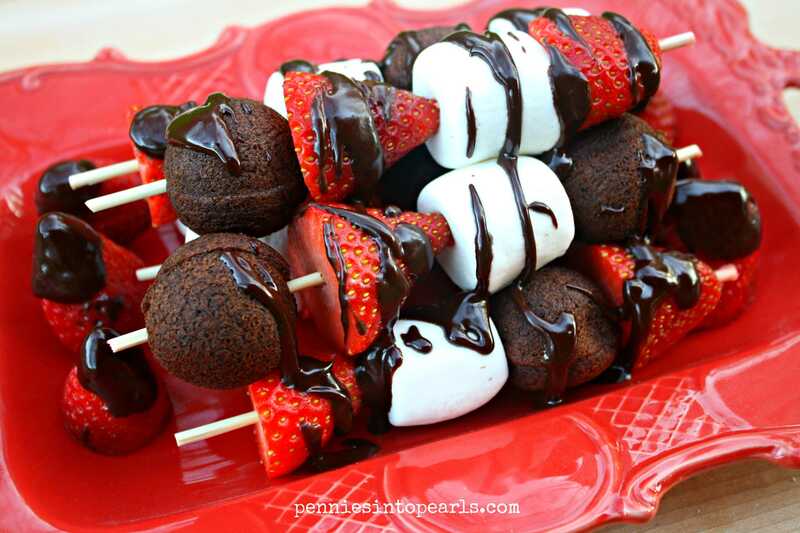 These strawberry kabobs look so festive for Valentines. I think they would even make a great classroom party idea. 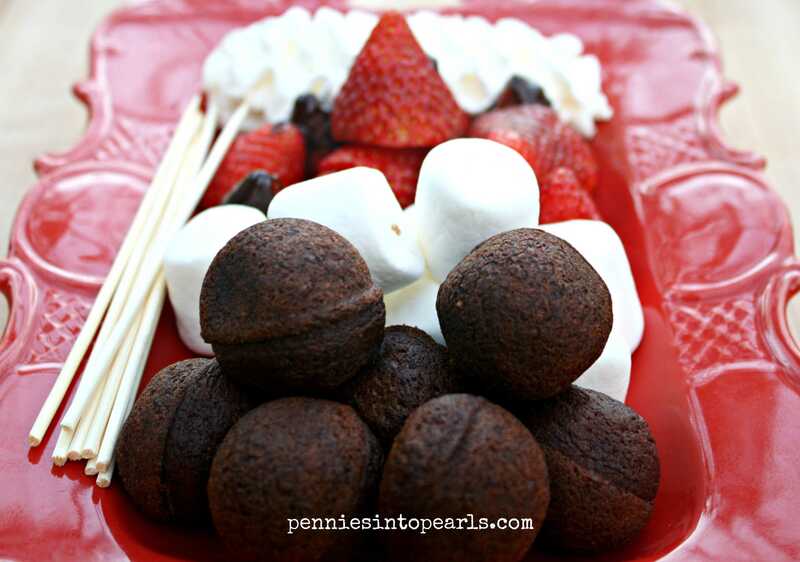 Is there a certain brand that makes the chocolate cake bites? Thanks Maren! I actually just made the cake bites from scratch with a cake pop maker. But I think some donut holes would be a great alternative! Thanks for stopping by! 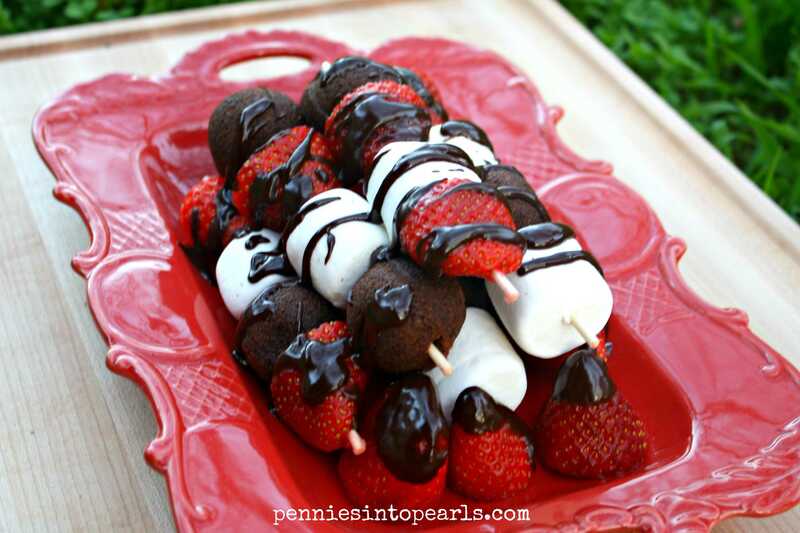 I love strawberries dipped in chocolate, and these kabobs are adorable and yummy looking for sure. You can’t beat chocolate and strawberries right!? Thanks for stopping by Nellie! Hi, Brittany! These are SO cute and they would be absolutely perfect for my kids’ Valentine’s Day party at school. Everyone loves foods on a stick — especially when there’s chocolate involved. 🙂 Pinned! Thanks for the pin Blair! My kids absolutely loved them and more than that my almost 4 year old daughter had a lot of fun helping me put them together! Thanks for stopping by! Wow…yummy! Those kabobs look absolutely incredible and so much fun! Thank you for sharing! PINNED! Thanks for the pin Michelle! My whole family couldn’t stop eating them lol! Yum! 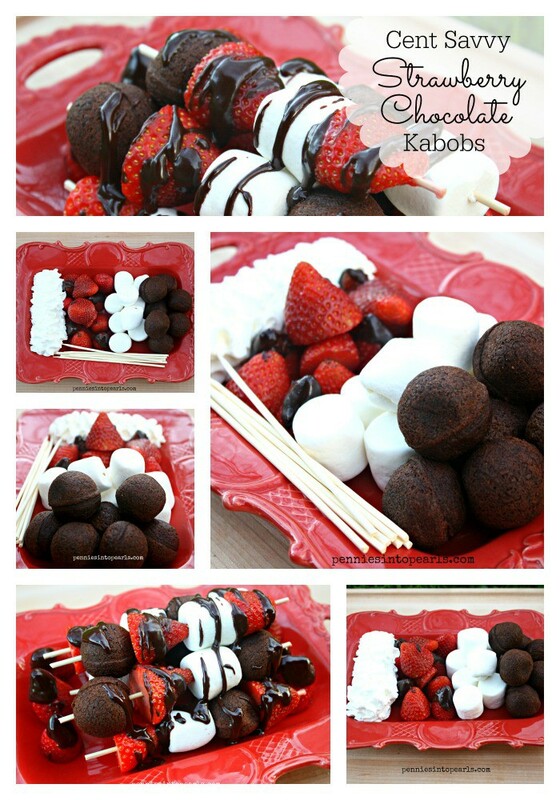 Love the idea of Valentine kabobs. And, I would love to have this at a party where everyone can assemble their own kabob. Thanks Heather! I didn’t think about it as a party idea! Thanks for stopping by! Thank you SO much Bonnie! I am so excited to share it with you and your readers!! Thank you SO much Denise! Such an honor to be featured on your super fun party! These are such a cute and creative idea–and they look DELICIOUS! Thank you for sharing with us at Merry Monday! Thanks for looking Amanda! Thanks for the party! Thank you Tia! I am sure they will, my kids couldn’t get enough. Super fun for them to make also!